Microsoft Azure Storage version removal: The older Azure Backup agents use a version of the Storage API that cause backup failures. Because of this, they will be removed soon. You can read more about the Storage version removal announcement on the Azure blog. The new agent fixes this by communicating through newer versions of Azure storage APIs. Renewal of server registration certificates: Machines registered over 2 years ago will receive this error: “A server registration certificate was not available to authenticate this server with the backup service." To avoid receiving this error, the agent must be updated to version 2.0.8719.0 or higher. Please note, the only mitigation to this error is to re-register the machine. This will have no impact on the existing backup copies and/or future backups. To leverage these new enhancements install the latest agent. On a DPM server, first update the Azure Backup agent, then update DPM to DPM 2012 R2 UR6 or above. How can I verify the installed Azure Backup agent has the mandatory fixes? Azure Backup agents with version 2.0.8719.0 or above has the mandatory fixes. You can verify the Azure Backup agent version number by navigating to the Control Panel –> All Control Panel items –> Programs and features –> Microsoft Azure Recovery Services Agent. How can I verify that the DPM server is UR6 are above? DPM server version should be 4.2.1312.0 or above. You can verify the DPM server version in the About section. Below are steps to navigate through once there. 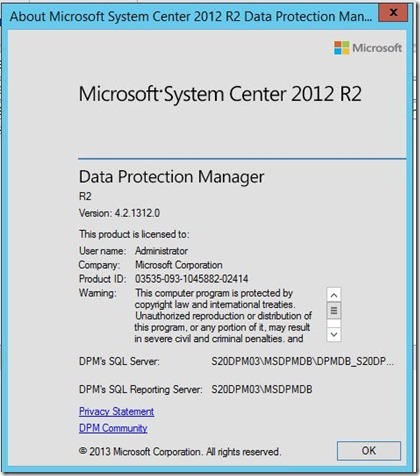 • Double-click Microsoft System Center 2012 R2 Data Protection Manager icon on your desktop to open the DPM management console. • Navigate to the Help menu on the top ribbon in the DPM management console. 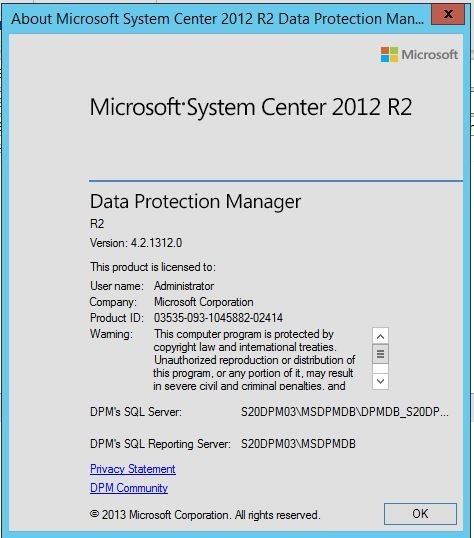 • Click About Data Protection Manager to show the server version information. Click for a free Azure trial subscription and download the latest Azure Backup agent to get started. Tell us how we can improve Azure Backup: Contribute new ideas and vote-up existing ones. Follow us on Twitter and Channel9 to get latest news and updates!